I have layered several felt shapes and stitched them together. Then, I stitched on a tiny glass nose. 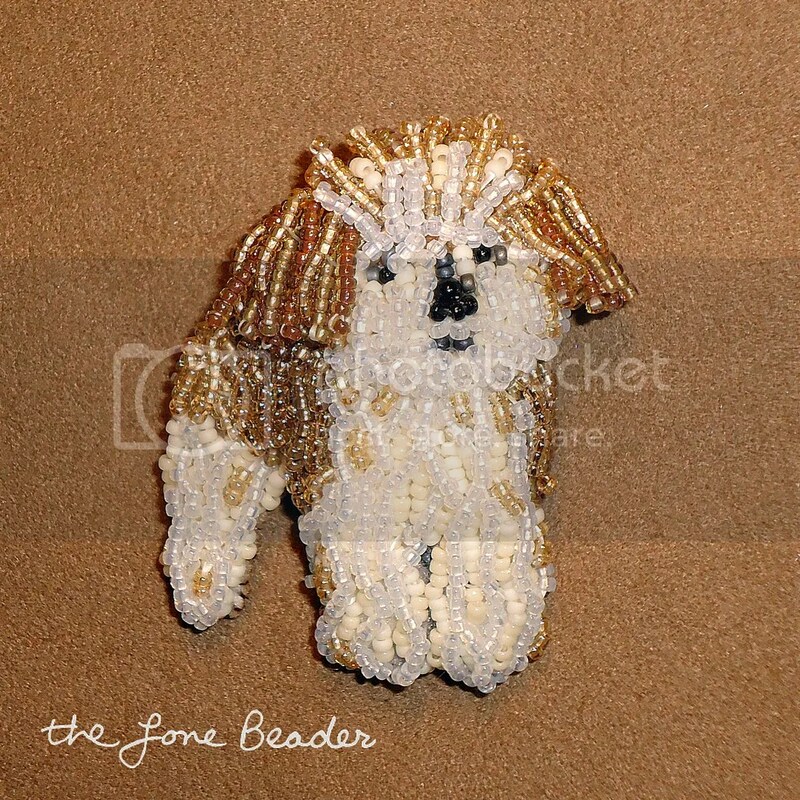 For the dog’s hair, I beaded short 2-bead stacks on its head and tail. 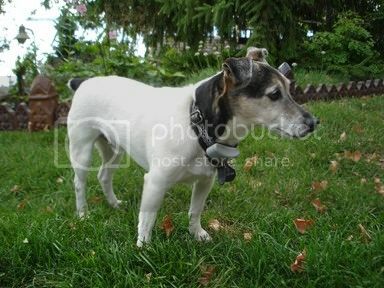 The dog’s body is made up of short 3-bead lazy-stitches which are very close together. This gives the piece the desired texture. I had wanted to make a rainbow poodle for awhile. I hope it makes you smile:) Please click the pic to view this item on Etsy.. 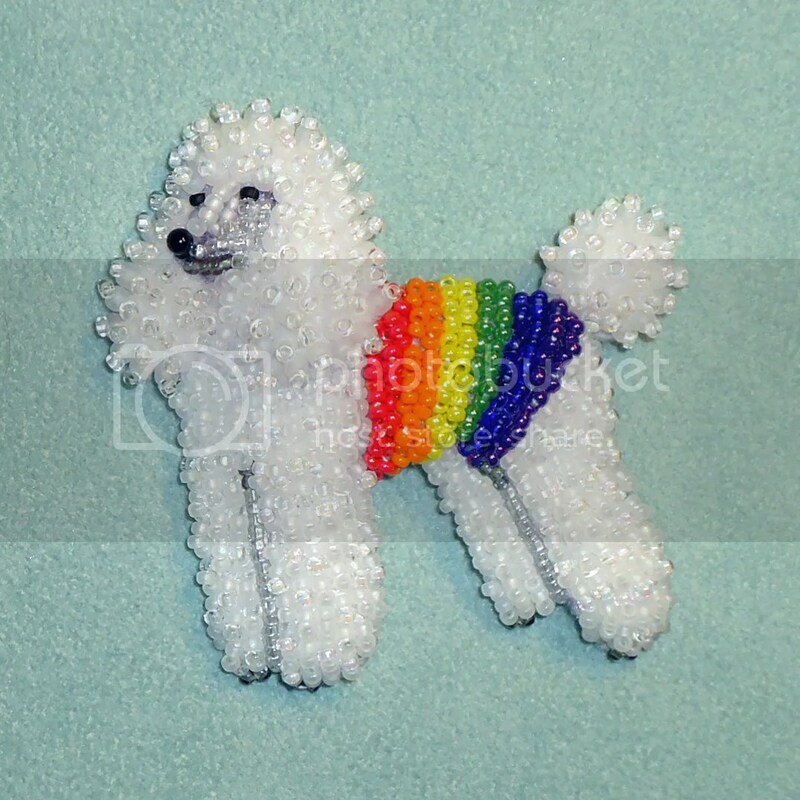 If you are interested in a custom beaded rainbow poodle of a different color, I would be happy to make it for you. Don’t forget, I am offering a 10%-off coupon code in my Etsy shop. Enter SAVE2016 at checkout now through October 31. 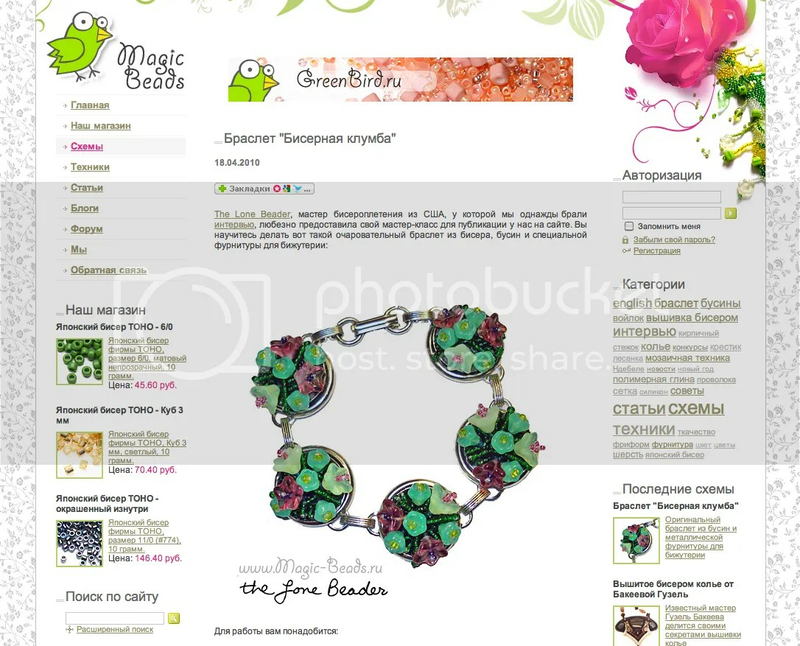 Thanks for your interest in my beadwork! New Purple Beaded Dalmatian Pin! 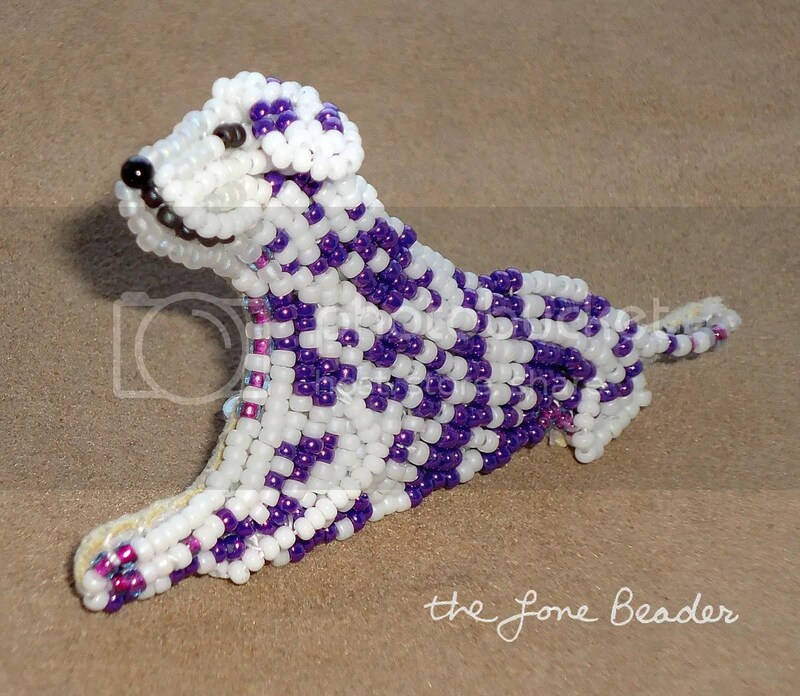 Just a quick post today to announce a new item in my Etsy shop – a purple beaded Dalmatian pin! A friend of mine sent me a few pics of Fluffy. Not knowing the breed, I worked from photos only. I came up with a sketch, cut out some felt and started beading. I used several different white, cream, and brown size 15 glass seed beads. The first layer of beadwork (above) is rather sparse, but the second layer more than makes up for it (below). 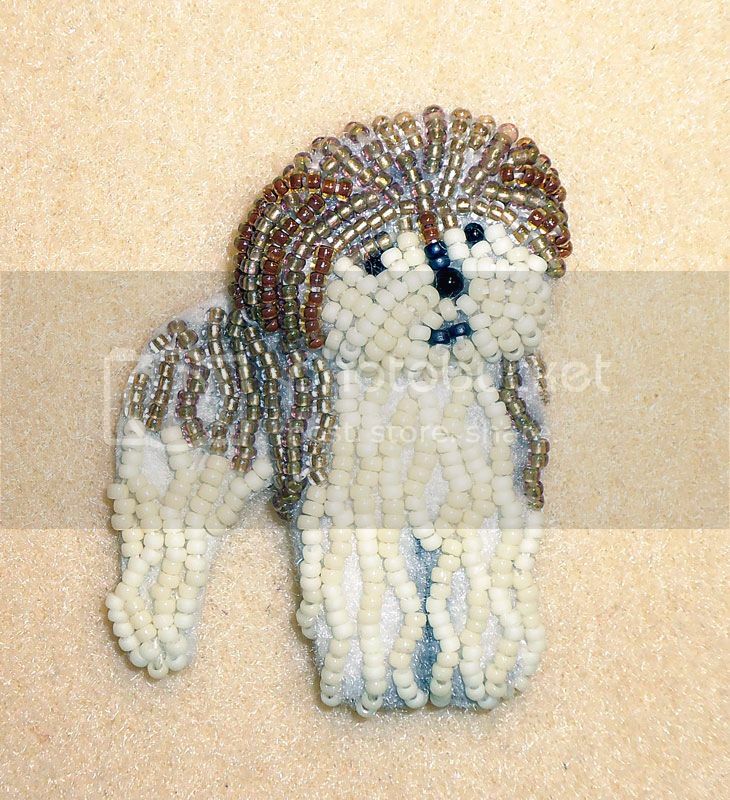 I also added some beaded loops and fringe on the dog’s ears to add dimension. Complete, this piece measures approx. 3cm x 4.5cm. 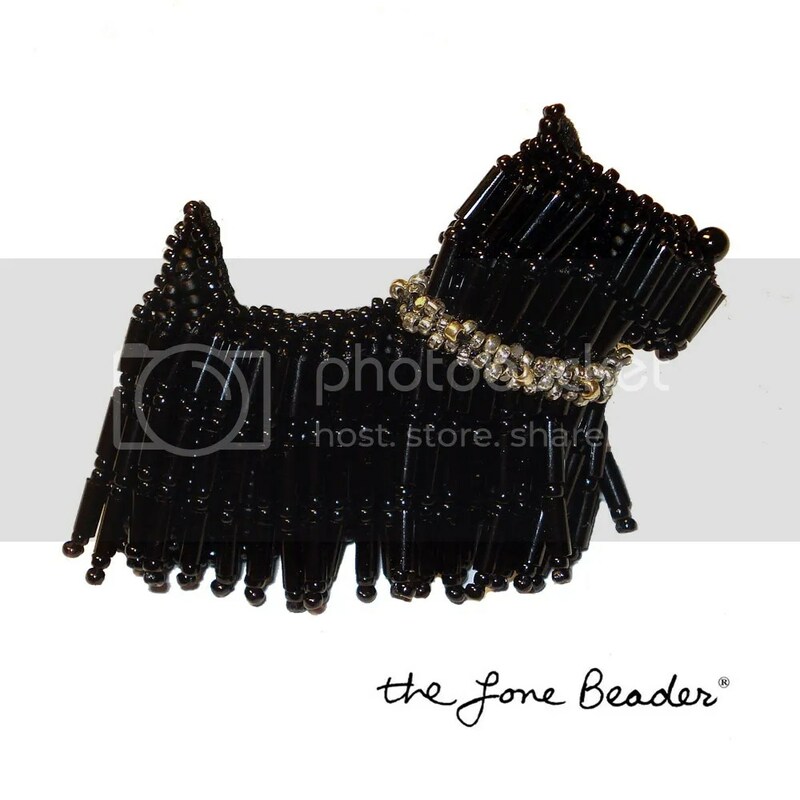 >New Beaded Scottie Dog Pin! I posted a photo of this piece in progress on my Facebook page, but here is how my finished pin turned out. I used only size 15 Japanese glass seed beads for the entire piece. 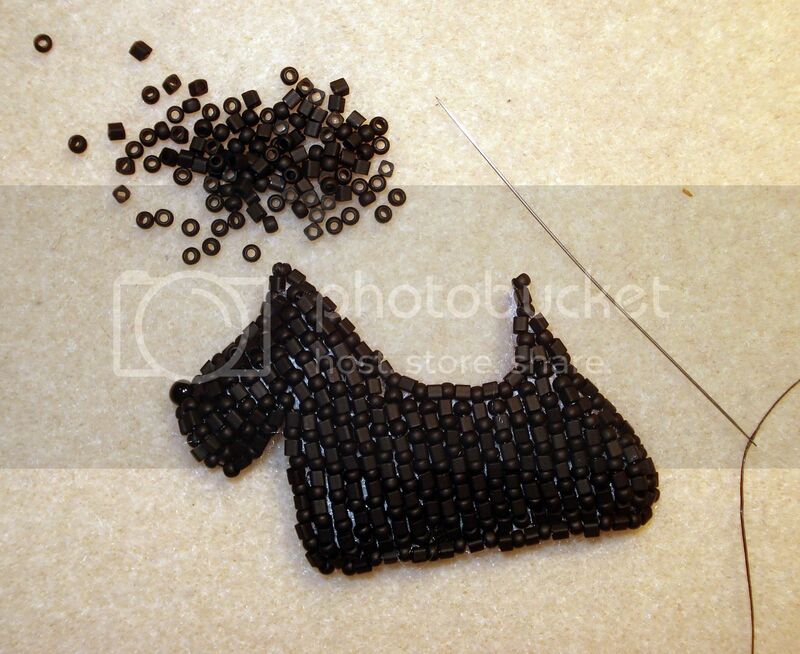 Beads are layered to make the ears and tail stand out just a bit. Given the small scale, I think it’s pretty close to the real dog… What do you think? 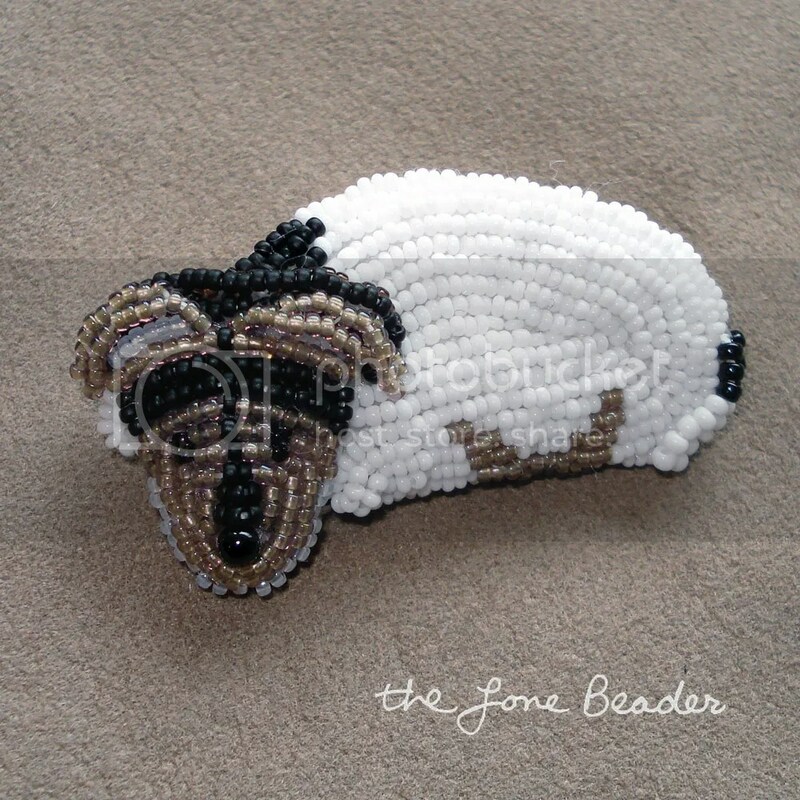 Beaded Jack Russell Terrier pin/ pendant. 2- 1/8″ wide x 1″ tall (5.5 cm x 3cm). 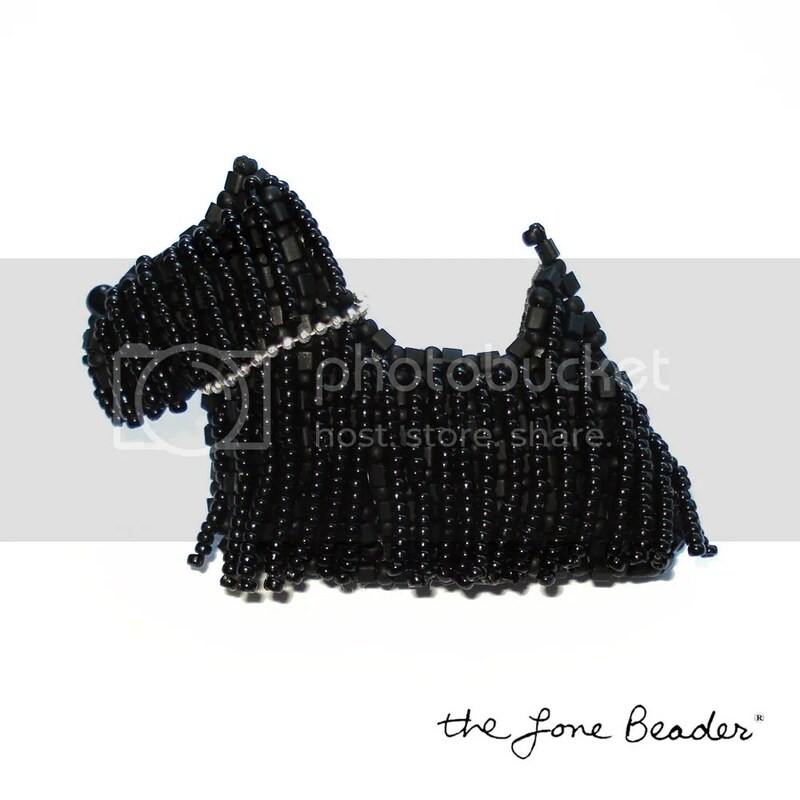 Today, just a quick pic to show you my finished beaded Scottish Terrier pin. I actually did a lot more beadwork to it. I added long beaded fringe using bugle beads. This fringe really moves when you touch it. The collar is also made from 13/o Charlottes in gold and silver. This pin seriously sparkles! I have listed this in The Lone Beader’s Gallery Shop (click the pic to view listing). So far, there are only a couple of photos. I will try to add more detail shots later. 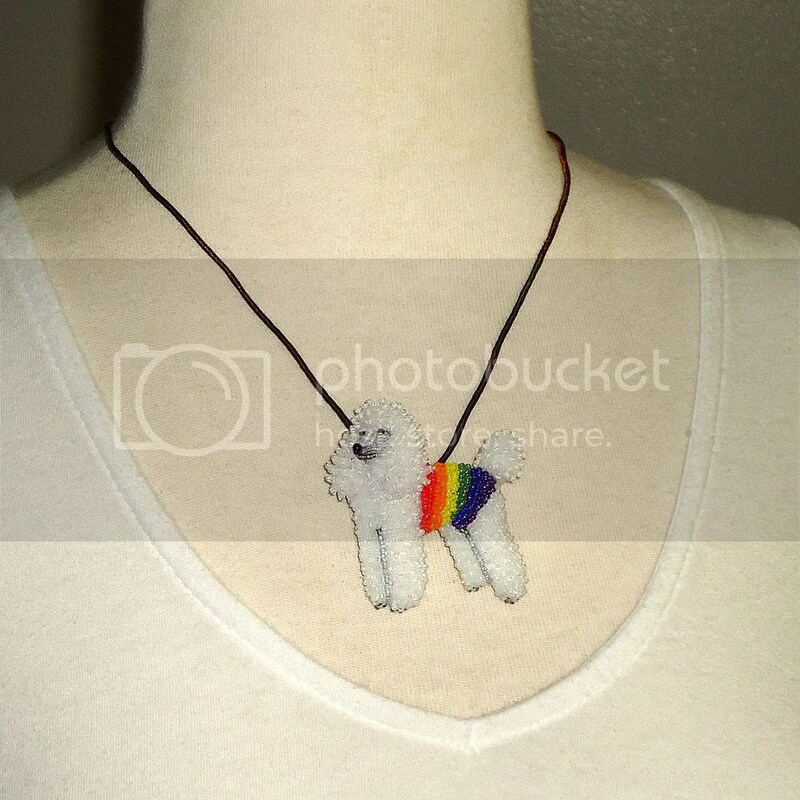 I think this will be a nice companion to the tiny beaded Scottie Dog earrings I made over the weekend! 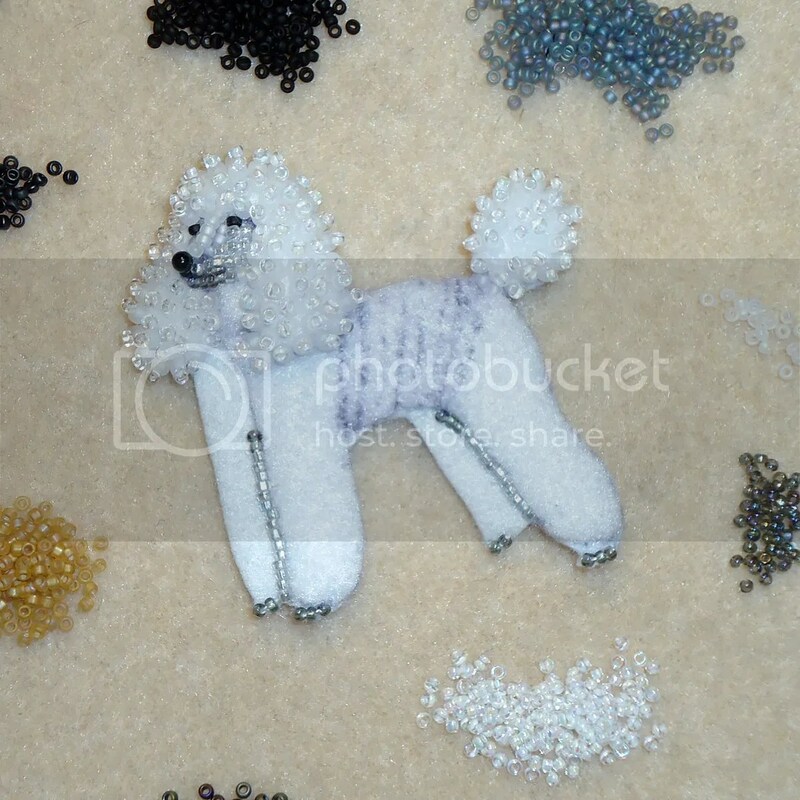 What kind of beaded dog should I make next?